We make potica the old fashioned way. Pastry is rolled wafer thin, then slathered with nuts, butter and honey. After that, it’s rolled into a log, cut into loaves and baked until golden brown and delicious! Some folks like it as is and enjoy a slice with a cup of coffee or a glass of milk. 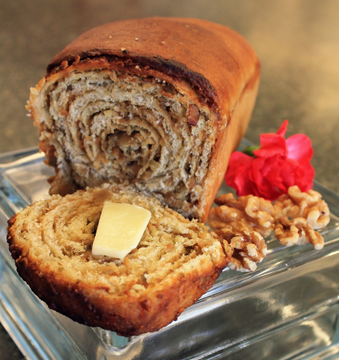 Slovenians will cut two slices of walnut potica, insert a piece of Black Forrest Ham and make a sandwich! We think all our poticas can easily star in a delicious desert…warm a slice in the microwave, top it with a scoop of ice cream, some caramel sauce and chopped nuts. 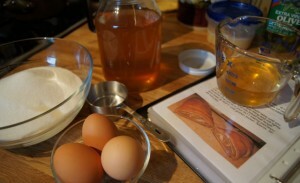 Or cut up a loaf and add it to Shipping will be added at checkout.your favorite bread pudding recipe. You are limited only by your imagination! 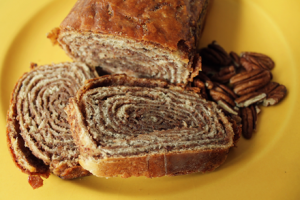 Our pecan potica has a load of pecans with maple and brown sugar. Price is $20 for the large, $14 for the medium, and $7.50 for the small. Almond tastes like marzipan with the subtle hint of cherry in the background. Price is $21 for the large, $15 for the medium, and $8 for the small. Our walnut is traditional. 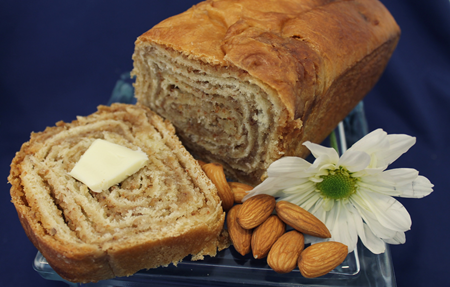 Cinnamon co-stars with the walnuts. Same as the walnut with the addition of ground golden raisins. Our shipping is done by USPS Priority Mail. Please contact me for shipping to Alaska, Hawaii, or the US Territories.